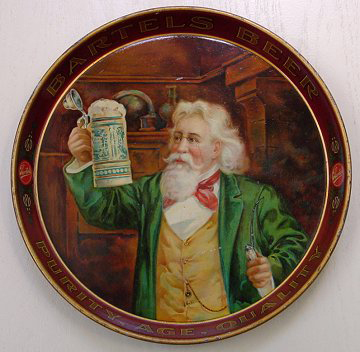 This pre-prohibition tray from Bartels Brewery in Pennsylvania depicts a kind looking bearded man holding up a large stein of the company’s brew. This tray is known among collectors as “The Professor” and was manufactured for Bartels by the Charles W Shonk Lithography Company in Chicago. The tray is a 12″ round with text along the bottom reading “Purity, Age, and Quality”.